'Arabian Sun' OGB (Peter McGrath, R. 2009). Seedling McAB99-128Z. AB, height 28" (71 cm), Early to midseason bloom. 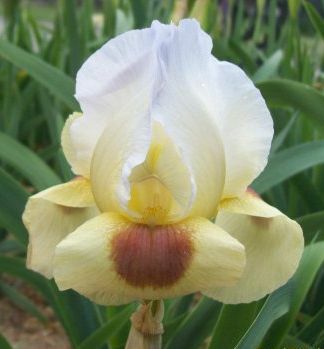 Standards palest lilac, fading quickly to white, style arms light buff; Falls pale yellow-buff; large orange-brown signal; beards gold. Shockey 93-108A: ('Sheba's Jewel' x 90-121-32: (88-177C, 'Queen Sheba' sibling, x 88-150C: ('Turkish Pendant' x 86-140T, 'Turkish Heart' sibling))) X Shockey 92-112, 'Desert Attire' sibling. Aril Society 2010.